Our Mother’s Day Tea on the Train was a great success. 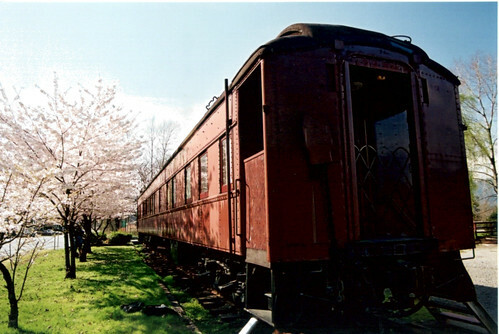 Many visitors came from all over the Lower Mainland to drink tea on our 1921 railcar, the Venosta. One visitor, in particular, proved extremely memorable. An older gentleman, he lived across the street from where the Museum now sits during the Thirties and the Forties. He remembers that an orchard occupied this land in those days. All along Murray Street, where the autobody shops, pleasure boat stores, pasta factories and other warehouses now stand, were Chinese gardens. Just to the northwest of the Museum (in the Boathouse parking lot) was a bunkhouse for the Chinese workers and they grew carrots and potatoes. Cows, too, strolled through this area. When the bunkhouse burned down, the Chinese went to stay in the Tourist Hotel until they got a new building. The white children of Port Moody, however, went to dig through the ashes of the bunkhouse. They found a few coins fused together from the heat and sawed them apart, taking them to the bank to trade them in for proper nickels, which bought an ice cream in those days. There were also Japanese boats all along the shores and, when the Japanese were interred in 1942, every school child cried for their lost friends. Yet, many children did venture onto the confiscated boats to try the sake left behind. Then there is Pigeon Cove at the eastern end of the Inlet: its namesake pigeons dreaded the annual September Pigeon Shoot. Chief Mackie also figured in our visitor’s stories. Our visitor told us he spent four hours in the City Hall jail cell for playing hooky. Ah! The good old days!